Wow, what an incredible honor—when I awakened this morning, I discovered that Crisis Chronicles Press has nominated my poem "Let's Get It On" for the esteemed Pushcart Prize! I am beyond thrilled. Thank you, John Burroughs, editor/publisher of CCP, and congratulations to the other five nominees: Kevin Ridgeway, Susan A. Sheppard, John Dorsey, Michael Ceraolo, and Tracie Morell! I wrote "Let's Get It On" for this year's Snoetry: A Winter Wordfest (held in Erie, PA back in January 2015) and it's included in the CCP NineSense Series chapbook Thunderclap Amen. 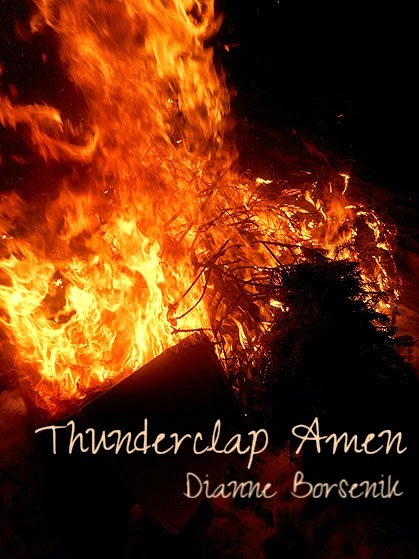 The title "Thunderclap Amen" comes from a phrase in the poem...full kudos to John Burroughs for picking it out and making it the title of the chapbook. You can read the original CCP announcement about the nominations HERE. You can order a copy of Thunderclap Amen HERE. You can read the original CCP book release announcement HERE. 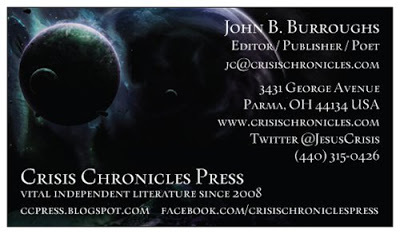 Once again, thank you, Crisis Chronicles Press! I'm doing the happy dance! What An Incredible Year This Has Been! As Thanksgiving approaches, I realize what an incredible year this has been for me, and how thankful I am for friends and poetry family. 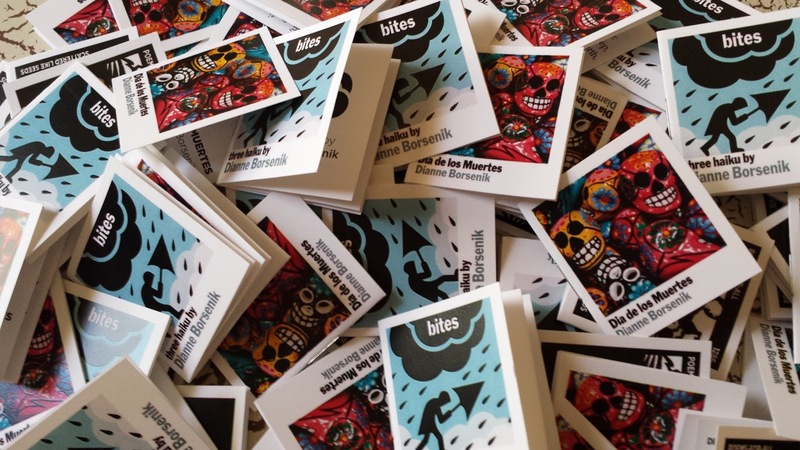 Right around the time of my birthday in February, Richard Robert Hansen of Poems-For-All accepted my poems and then gifted me with stacks and packs of little micro books that he created using my poem Dia de los Muertes and three winter haiku. I'm truly honored to have my little books counted among the astonishing number and caliber of his poetic creations. I must also thank John Dorsey for introducing me to Richard and his wonderful little books. 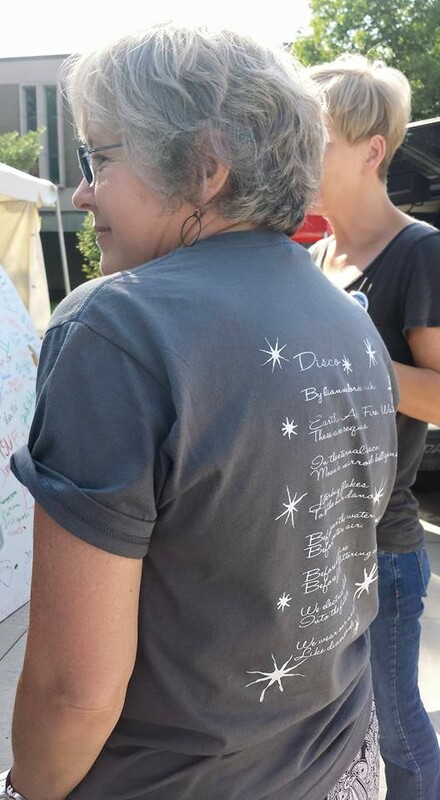 In April, to celebrate Poetry Month, the Cuyahoga County Library had their Read + Write: 30 Days of Poetry; Diane Kendig chose my poem Pools Of— for Day 13. You can read all the poems here: Read + Write: 30 Days of Poetry. 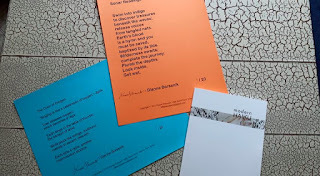 In June of this year, 48th Street Press published two sets of limited edition broadsides featuring my poems The Color of Oxygen and Sonar Readings. Thank you, Christopher Byck, for doing such a lovely job with them! 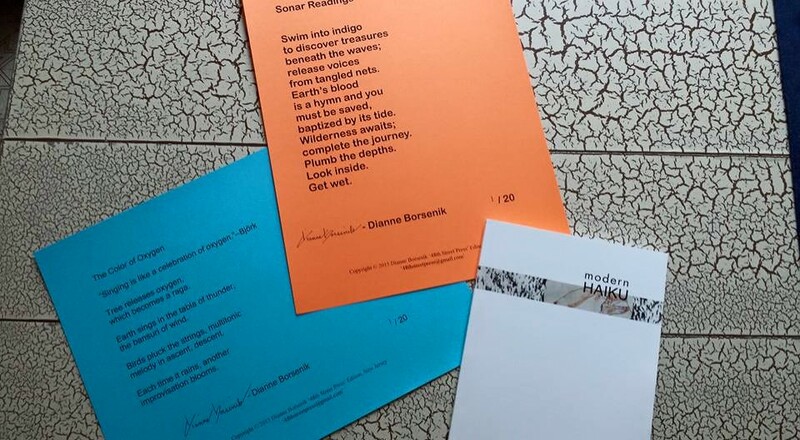 My haiku appeared in Modern Haiku and bottle rockets, two beautiful publications, and I was given the opportunity to compete in my first Haiku Death Match. Although I didn't win, it was fun to participate in it, and I'm already looking forward to the next one. 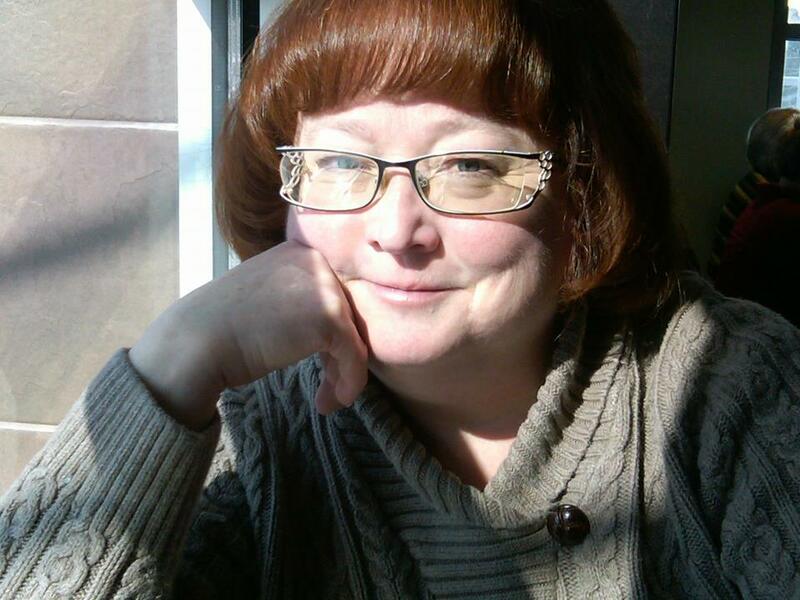 Also this summer, Karen Schubert offered the opportunity to submit ekphrastic poetry to a Lit Youngstown competition, and to my astonishment, I won. 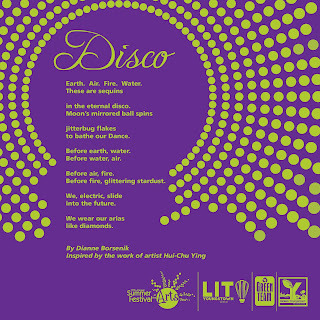 I am totally thrilled that my poem Disco appeared on the gorgeous violet-and-lime tote bags given away at the 2015 Youngstown Festival of the Arts. 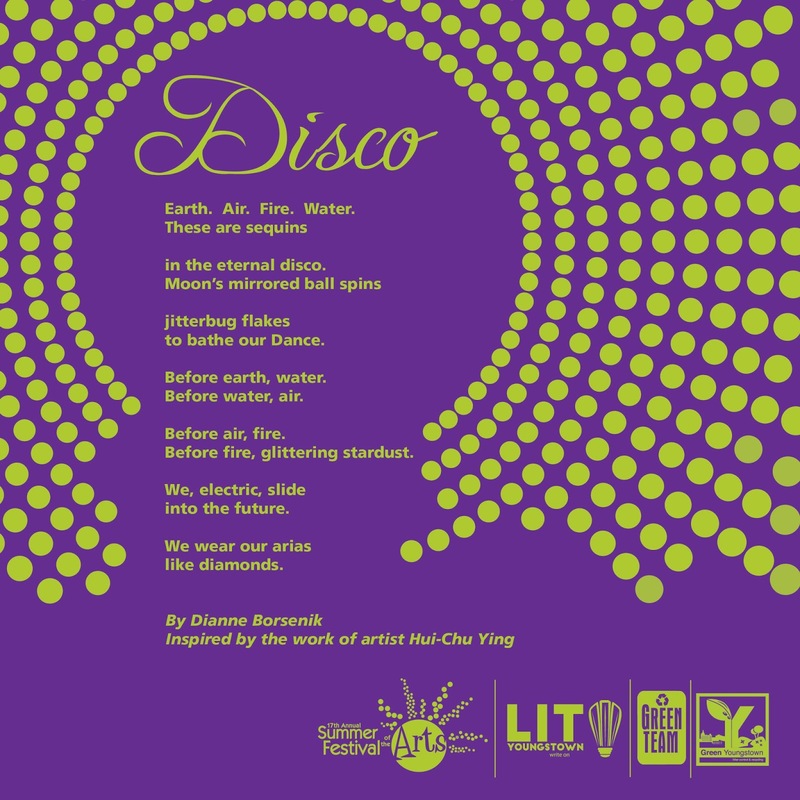 Then Lit Youngstown put Disco on their tee-shirts! I'm on a tee-shirt...I feel like a rock star! Crisis Chronicles Press published a new chapbook for me, Thunderclap Amen, as part of its NineSense Series. The nine poems included are Cue Brick, or How I Learned to Stop Loving the Bomb and Start Worrying, Karma Café, Let's Get It On, Polar Vortex, Happy Hour, 'S No More, Transcending Gender, Around the Block, and Mother Tongue. Once again, editor/publisher John Burroughs created a beautiful book for me, and I'm proud to be one of his press' published poets. Jameson Bayles, a poet in Kansas City, invited me to come read in KC as part of a mega-poetry event next year, in April of 2016...it's going to be the Kansas City Poetry Throw-Down! 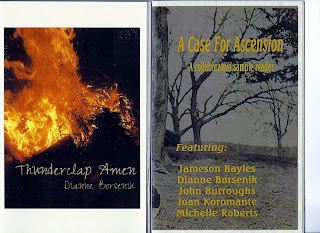 As a buildup to the event, Asinimali Publications published a collaborative chapbook, A Case for Ascension, containing three of my "ascension" poems. The other collaborators (ooh, that sounds sort of criminal!) are John Burroughs, Jameson Bayles, Joan Koromante, and Michelle Roberts. 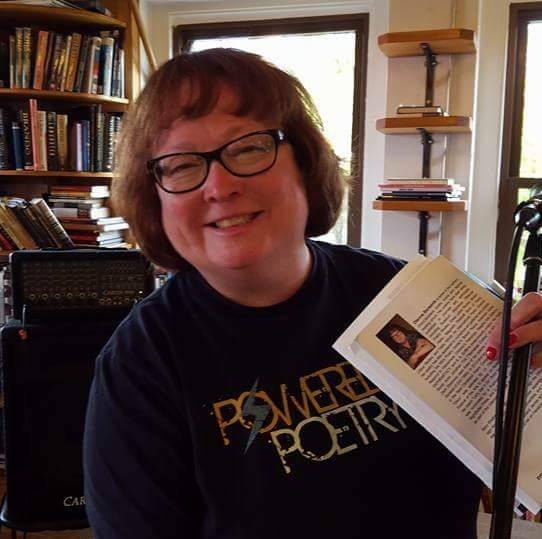 I'm thrilled to be included in this poetry band of brothers and sisters! 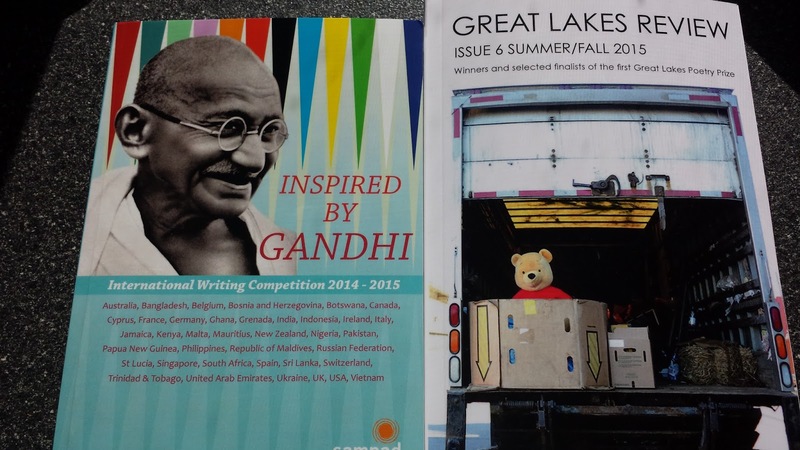 From the moment I first laid eyes on Great Lakes Review, I fell in love with the publication, which showcases writers across the Great Lakes region. I'm very honored to say that four of my poems appear in the current issue, and I'm especially pleased that two of them are ekphrastic poems and two of them are performance pieces. 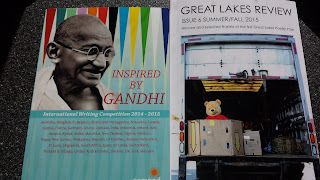 I also had work accepted for two very different anthologies: Inspired by Gandhi, published by Sampad.org.uk, and Quarried-Three Decades of Pine Mountain Sand & Gravel (Dos Madres Press). Ten of my most requested poems appear in The Poetry of S.O.U.L. 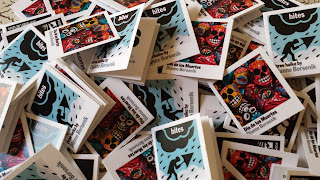 An Anthology of Selected Works from Poets Around the World. I participated in SPACES Pedestrian Poetry, where I sat at a booth in an art fair across from Cleveland's famed West Side Market, and went waaay outside my comfort zone by writing poems "on the fly" for strangers who approached me and requested a poem. It turned out to be a wonderful and rewarding experience! In November, I participated, as NightBallet Press, in the "Meet the Presses" event hosted by Lorraine Cipriano at the Sanger Branch Library in Toledo. It was a wonderful afternoon! 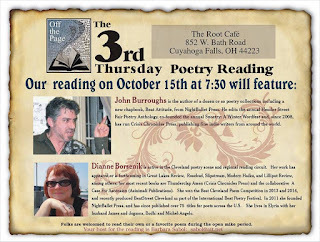 I had the glorious opportunity to travel to several different poetry events, both with friend and poetry partner John Burroughs, and solo. We hit Toledo for a reading at the West Toledo Branch Library, and encountered rain and wind on a biblical level. Yes, I wrote a poem about it. I read at Youngstown State University during their Festival of the Arts, and also read at SUNY at Fredonia, NY as part of the International Beat Poetry Festival. 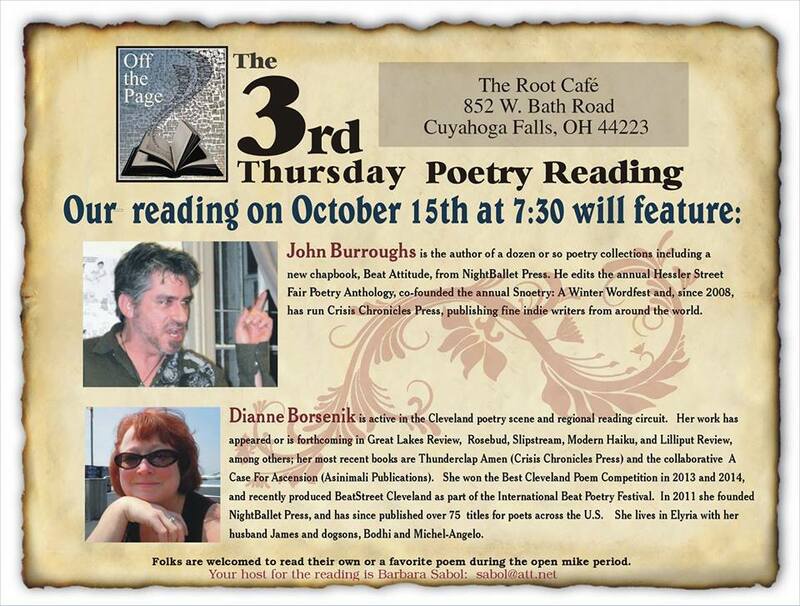 John and I traveled several times to Farmingon, MI, just outside Detroit, for readings at their S.O.U.L. events, and we both read in Lorain, Ohio, during the Lorain Arts Council's Soul Speak event. We also closed out the 3rd Thursday at the Root Café series. We are very sorry to see the series end, and I thank you, Barbara Sabol, for the opportunity to be a part of it. These are only some of the poetry things that have kept me going through a personally difficult year. I've been honored to publish several more talented and deserving poets through NightBallet Press. BeatStreet Cleveland was one of the high points of my life, getting to hear so many exciting poets and musicians in one place! You can learn more about NightBallet Press and BeatStreet Cleveland at those websites. Make no mistake about it, I realize that I am lucky and blessed to have had so many opportunities and experiences. I love spending time with my extended poetry family. I cherish my poetry friends, and I cherish all the things we do together to celebrate the spoken and written word. I thank you, dear brothers and sisters, I send you hugs and wish you all this best Thanksgiving 2015. This is where I'll be next Saturday! The event will include an open mic, refreshments, and music by Undisputed Truth. 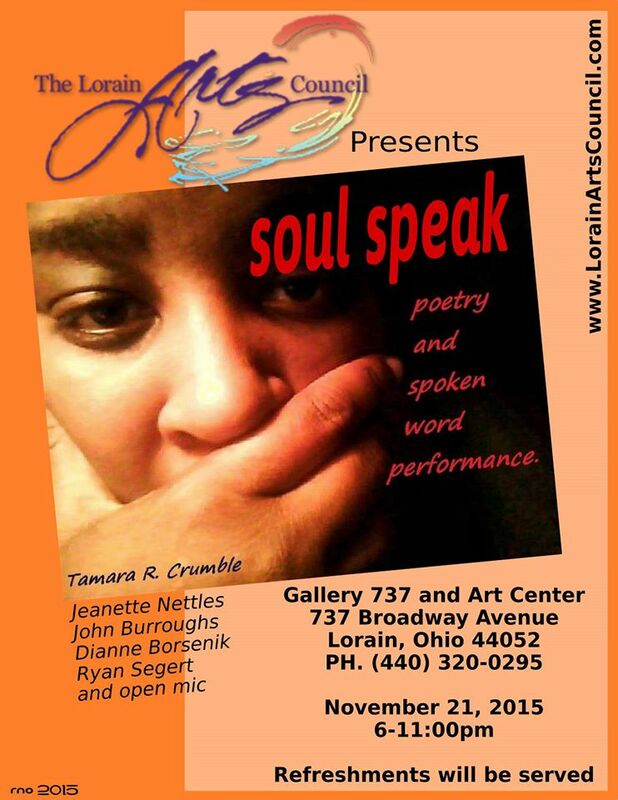 I invite you to join us there as we speak our souls, share some hugs, and generally groove.